When your cruise ship docks in Boston, see the best of the region on this sightseeing shore excursion! On this 3.5-hour morning tour, visit important historical areas from the Revolutionary War and learn about important figures like George Washington and Paul Revere. Explore beautiful Harvard University and learn the significance behind every site you see from your expert local guide. After a short walk from the Boston cruise port to the Seaport Hotel, where your tour departs, your Boston sightseeing shore excursion begins in Cambridge. Drive along ‘Tory Row’ to admire 18th-century Colonial mansions and learn about the American Revolutionary War from your expert local guide. Visit Cambridge Common, where George Washington gathered his troops. Spot the former home of writer Henry Wadsworth Longfellow, whose famous 1860 poem, ‘Paul Revere’s Ride,’ commemorates Paul Revere for riding through Boston, warning the patriots of an oncoming British attack. Then, arrive at the oldest part of Harvard University: Harvard Yard, a beautiful grassy area spanning 25 acres (10 hectares). 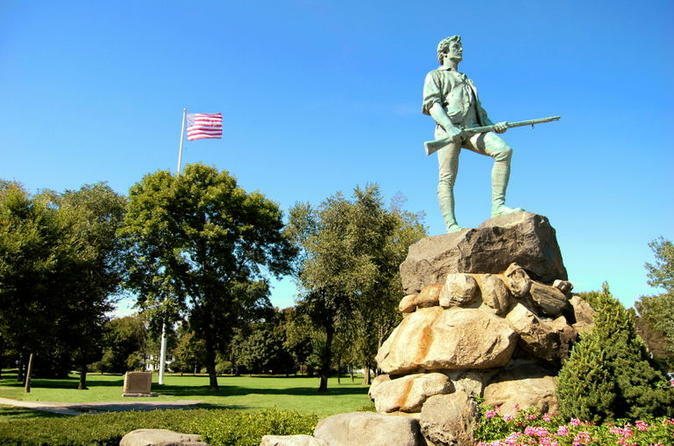 Visit Lexington Green, the site of the Battle of Lexington where some of the war’s first shots were fired in 1775. Learn how Captain John Parker commanded the Lexington militia during the Battle of Lexington on April 19, 1775. In Concord, journey past the homes of world-renowned writers and poets like Nathaniel Hawthorne, Ralph Waldo Emerson and Louisa May Alcott, author of Little Women. Visit a famous battle trail from the Revolutionary War and listen as your guide illustrates interesting historical anecdotes. Finally, make your way to the Old North Bridge, now part of the Minute Man National Historical Park. We will ensure your excursion ends with ample time for you to return to the Black Falcon Cruise Terminal for your ship’s departure. In the extremely unlikely event your ship has departed, we will arrange for transportation to the next port-of-call. If your ship is delayed and you are unable to attend this activity, your money will be refunded. See our terms and conditions for full details.